Recently Airwolf 3D presented its new invention, the latest desktop 3D printer the AW3D HD-R during International Consumer Electronics Show (CES) in Las Vegas scheduled for this year. To stand out from the line and to present their fresh breakthrough the team had decided to 3D print the clothes and accessories from more than twenty various materials that were displayed during CES on January, 6. The HD-R is the recently developed in the range of award-winning desktop 3D printers for the professional demand. The company’s novelty establishes new standards suggesting higher resolution, Wi-Fi connectivity, dual head printing, file storage and management, cloud-based slicing, and a rigid aluminum backbone. It is combined with the software on the AstroPrint 3D printing platform that utilizes the cloud that reduce the necessity of desktop software. Thanks to such intelligent software and its Wi-Fi capability it is possible for users to print from any tablet device (like a smart phone) remotely. 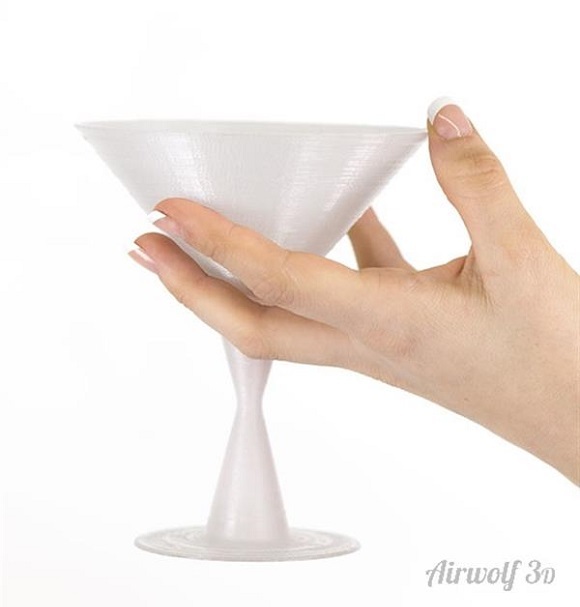 As chairman and founder of Airworld 3D Erick Wolf explained they’ve managed to combine high quality print using a great variety of printing materials with surprisingly easy use. Thus their product is the most advanced at present. Apart from that Airwolf joined forces with 3DaGoGo – the creator of the 3D printing all-in-one platform called AstroPrint – to offer the current customers Wi-Fi upgrade equipment called WolfWare. These days Airwolf has been accepting pre-orders for HD-R, the suggested price for which is $4595. The WolfWare equipment will be sold at about $250. It’s good to have an innovative 3D printer, but if it fails to reach the target audience, it won’t be a success. In this respect Airwolf 3D thought that it’s necessary to have something different, something that could really interest the public so as to step out of the line, out of other 3600 exhibits during the International CES. 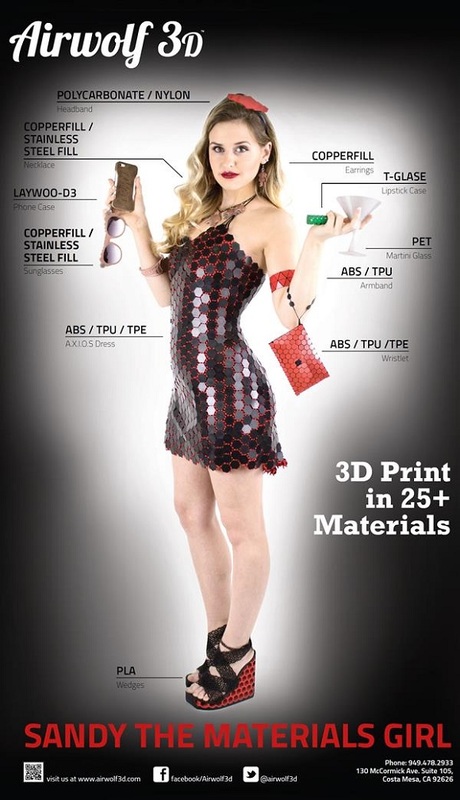 And is there anything more striking and noticeable than a pretty woman in a small black 3D printed dress? 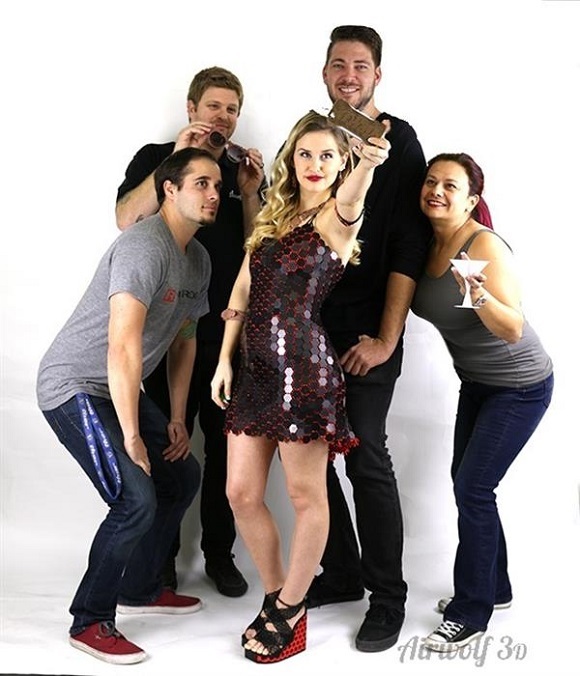 A nice young woman from Southern California has demonstrated a nice custom-fit dress and the accessories, which are totally 3D printed by Airwolf 3D. They are nice examples showing that it is possible to print in as many as 25 various materials; that’s more than any other market product. The A.X.I.O.S. Dress was designed and created by Cameron Williams; the abbreviation stands for Advanced Xtreem Integrated Operating Scales. It’s made of ABS, TPE and Wolfbend TPU, which cost about $78 in materials. He used the same materials to design the lady’s lightweight SoCal Wristlet and the wristband. Among other accessories there are jewellery made of stainless steelFill and copperFill, an emerald case for lipsticks 3D printed using green T-Glass to achieve semi-transparent effect and also an iPhone case printed in Laywood. Designer Jowell Randal altered the material to make it more leather-like and to protect iPhone from accidental falls. All women will agree if we say that to complete an outfit you need a suitable pair of shoes. The shoes 3D printed in black and red PLA (like the iPhone case) are absolutely biodegradable. And last, but not the least, an exquisite martini glass is printed from PET. this is a fascinating material that offers strength and flexibility. It’s worth mentioning that FDA approved of using the material in contact with food as it doesn’t absorb water as nylon, for instance, does. If earlier you thought that the world of fashion and the world of 3D printers had nothing in common, now it’s time you thought of it once again. It’s obvious that the creation of such impressive clothes demanded careful thought and even more careful and delicate work, especially if you think of the hexagonal mirrored mirror parts of the lady’s dress, shoes, armband and wristlet. It’s a nice example showing that HD-R is suitable to work with a wide range of materials and to turn them into almost everything you can think of. If you had a chance to visit the International CES, where lots of developers, suppliers and manufacturers of consumer technology equipment and content were displayed, you may have seen one of Sandy’s fashion shows. 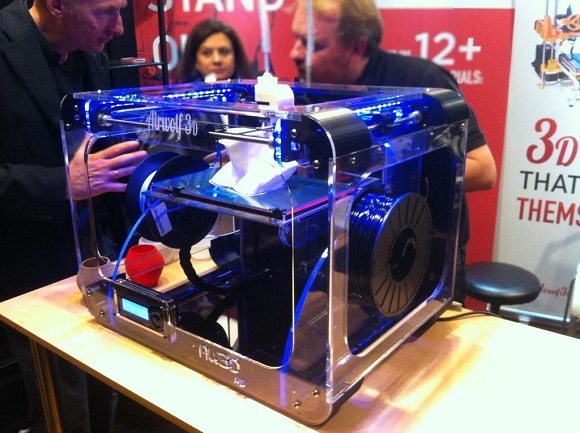 The year 2015 has just begun, but there have already been some considerable breakthroughs in 3D printing world.